I'm Mr. Chang, a high school social science teacher in San Jose, CA. At the moment, I teach World History to sophomores and Government/Economics to seniors. I am asking for your help to fund my classroom for the 17/18 academic year! I am a first-year teacher. I previously held a job in tech, working in marketing. It didn't feel rewarding to me. I felt I wasn't making a positive impact on our society. I left it to become an educator, which is something I've always want to be anyways. And here I am now. My education philosophy and my curriculum is centered around my students. They revolve around the question: How do I relate to this? I don't teach my students to love history and the social sciences. I don't expect them to. Just because I am passionate about it doesn't mean I have to force it upon them. Instead I focus and teach my students to understand why the social sciences matter and how the very progress of their own lives and exploration of various identities are the social sciences. History is not just about memorizing names, dates, and facts about dead people and answer a multiple-choice test. That's the reason why people hate history and/or find it extremely boring or useless. Instead my curriculum does not even focus on those. I refuse to offer multiple-choice assessments. It forces students to memorize facts rather than understand why the content matters. The assessments I offer are all open-ended. Students apply what we have learned and create their own opinion and interpretation. Social science classes such as history, government, and sociology may not yield or reward a high-paying career like a STEM field, but it enriches one in a different way. The social sciences help students explore how people interact and develop as a society and culture. The soft skills gained from a social science class are the exact same skills many employers look for today: critical thinking, research, EQ, and communication skills. Career advancement or termination is sometimes not a result of what you are able to do or not, but on the basis if you can work with other people. The social sciences explore that very social interaction and develop communication skills among students. It is the combination of the social sciences, arts, and STEM that can make one a truly well-rounded candidate. 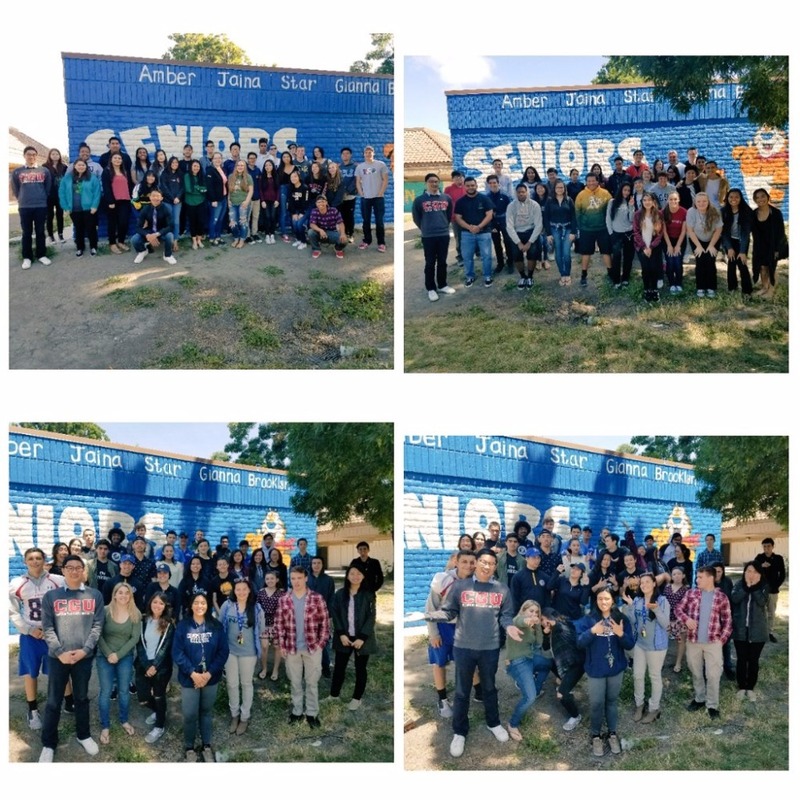 Your donation will help support my classroom and the various activities I do with my students. 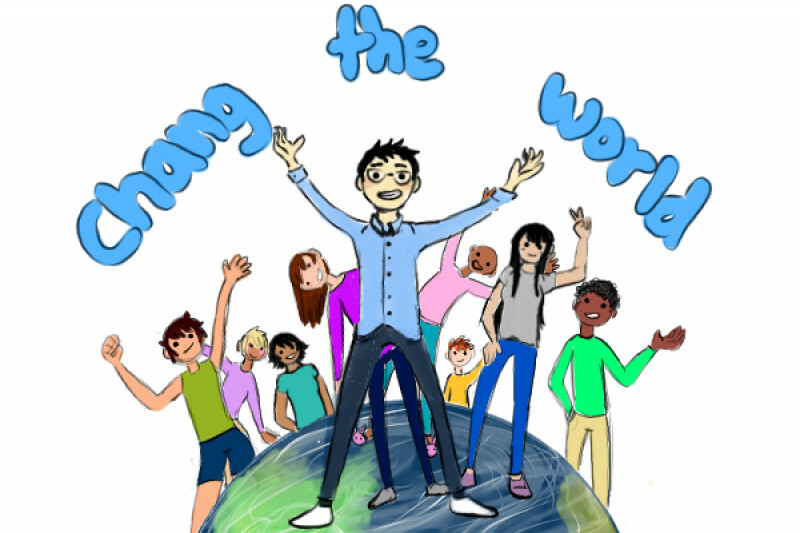 With what is going on in the state of the world, I believe, especially as a social science teacher, effective positive dialogue and collaboration are the necessary pillars of stability and peace for posterity’s sake. That is something I am trying to build within my classroom and beyond. So far, I have spent at least $1,000 of my own money in my classroom on items such as notebooks, resource books, supplies for activities, and snacks and water. Some may say that the things I get for my classroom and students are unnecessary. But you know what? I think it is ABSOLUTELY worth the investment. Our students are the future! However, this isn't very sustainable in the long run with my income, so I am asking for your help to help me keep my classroom running effectively. I ask all of my students to keep a notebook throughout the year. I found out during my first year that I am not allowed to ask students to get supplies for class. Instead public education is to provide all the materials for them. Some students may already have notebooks in hand, but not all. Any extra notebooks will roll over to the next academic year. This includes markers, color pencils, poster paper (a huge roll of butcher paper), gluesticks, notebook paper, cleaning supplies, and any other misc. school supplies that I provide to my students. - Resource Book Fund = ~$100. Though a textbook is provided, I supplement most of my curriculum with outside resources. I incorporate outside readings and books for a more enriching experience than using a dry and boring textbook. For example, I had my Econ students read "The Richest Man in Babylon" as part of our personal finance lessons. I had my Government students read and critique Noam Chomsky. My World History students exerpts from a book about totalitarianism. I plan to rotate texts and resources out to keep my content as relevant to my students as possible. And books cost money. - Classroom Activity Fund = ~$150. You'd be surprised. Sometimes I want to do a really engaging activity or simulation with my students, but I couldn't because I can't afford to get the material required for it. You can check out below that this one single activity I did with my students (51 World History students) cost me $20. Another activity I did that used M&Ms with all of my 149 students cost me around the same. In order for me to continue to incorporate interesting and engaging actvities for a "boring" subject such as history, it'd be nice to have funds to support them. The $150 should last me through the year. I am cover the rest on my own. - Snack & Water Fund = $10/month, $100. I spend between $20-30 at Costco to supply my classroom with a variety of snacks. I will continue to subsidize the rest with my own money. I don't want to ask to entirely fund and cover something I opt to do voluntarily. Additional funds beyond the target will help me get classroom sets of texts I use in the classroom beyond the textbook. A question some of you may have. Do I HAVE to offer and feed students? No. But let's face it. We were all students once. Sometimes you are so busy you forget to eat breakfast. Or sometimes you just need that extra energy boost to last you through the day. That even happens when we're at work except there is no snack drawer available to students. Or what if your family can't afford food? The snack cabinet I have is open to all students, not just my own. And this means I go through the food even quicker, requiring frequent restocking (Costco runs). Students are extremely appreciative that this is offered to them and in return they are more receptive to my teaching. The postcards below was something I opened up to my entire school community rather than just my class. 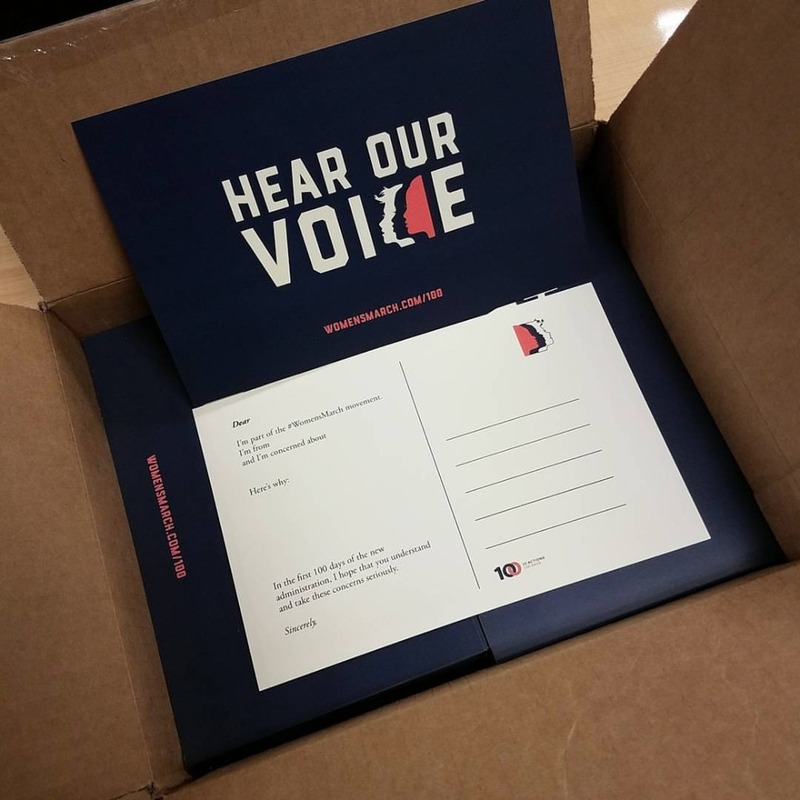 Though the postcards carry Women's March branding, the purpose of it is nonpartisan and it was entirely voluntary. After the 2016 election, I noticed many students became very concerned with the current and future state of affairs. There were talks of things such as a school walkout. I didn't see much constructive value in a school walkout. Instead, I wanted to offer a different form of civic engagement, which is writing postcards to their politicians and tell them how they feel. After all, they are the future and the actions of today will affect their lives. Again, students were not forced to write postcards. 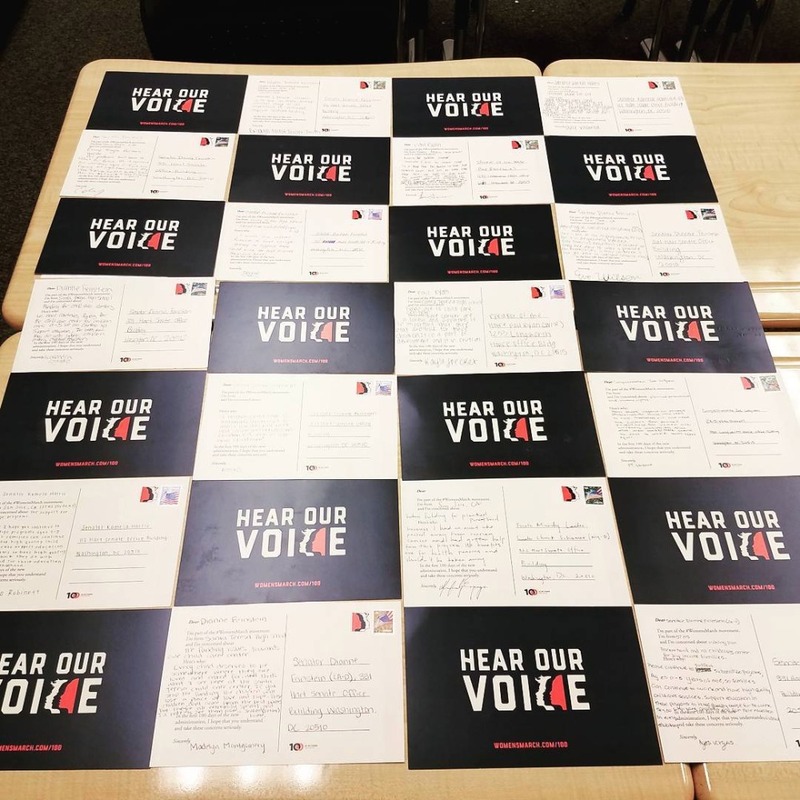 It was entirely voluntary and students wrote to members of both political parties. I merely offered a platform for them to voice their opinions and concerns. 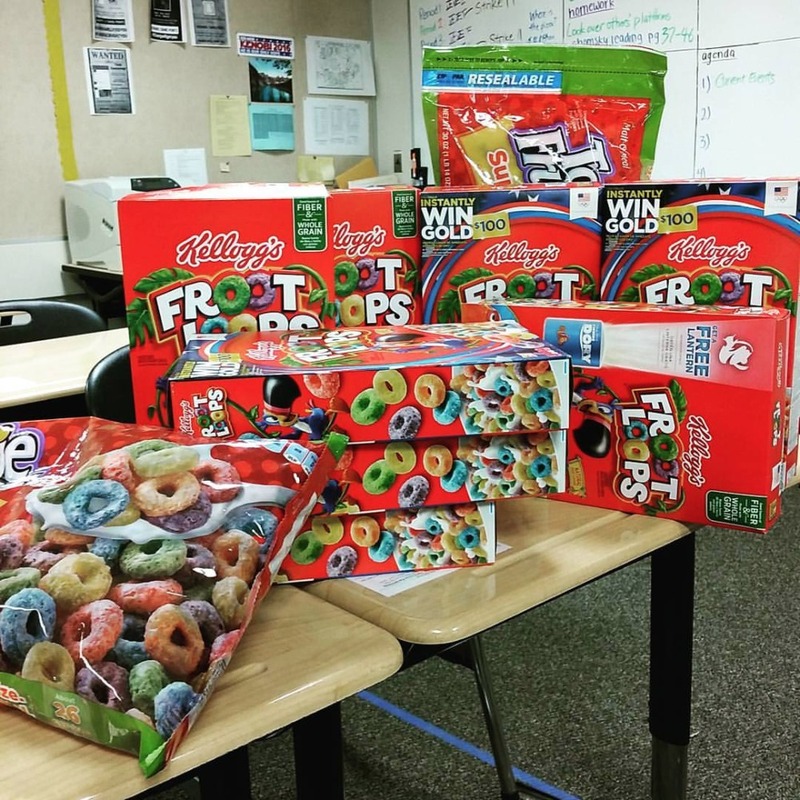 I bought a bunch of Fruit Loops for an activity I did with my World History students during our Industrial Revolution unit. It was fun for the students and it also gave them something to snack on after. 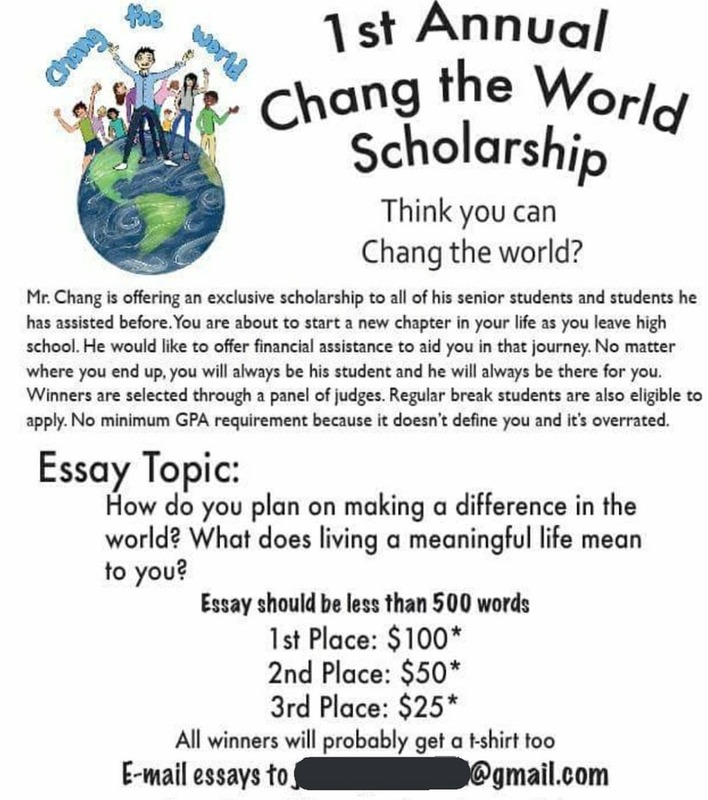 Any additional funding will go towards a scholarship fund I have started known as the Chang the World Scholarship. Life is expensive and I want to do what I can do help my students out. Regardless of where my students end up, they will always be my student. I got this idea from a former high school teacher who had given one of my friends some money for college. I thought I would like to open up this opportunity for my students. The scholarship is open to all of my senior students to apply whether they are college bound or not. They can apply as long as they are life bound. The scholarship does not judge students on their academics and achievements, but on their potential to make a difference in our world and live a meaningful life. This year's scholarship is funded from a stipend I received from Next Gen Personal Finance (NGPF) after attending one of their personal finance workshops. I have used many of their lessons and resources to teach personal finance to my students. You should check them out and you might learn something new yourself! I would love to keep the scholarship going every year, but this would mean coming out of my own pocket. The more additional funding available means more students can receive more aid. There you have it. That's my story and pitch. Thank you very much for your time and I hope you can help my classroom out! My GoFundMe campaign received the $1,000 contribution from the GoFundMe team as part of their #WeLoveTeachers promotion!!! This donation will help fund my classroom and the 2nd Annual Chang the World Scholarship next year!!! Thank you all donors! I couldn't have done this without all of you!!! We have met our goal of minimum goal of $500!!! Thank you so much, donors! GoFundMe has a campaign going on where 100 teacher campaigns who have met $500 will be selected to get another $1,000. That's additional resources that I can potentially use towards my classroom. I have attached a picture of my seniors who have largely benefitted from the money I spent. Look at all the smiles! The money you have donated will put more smiles into next year's students! Again, thank you SOOOOO MUCH! The rewards will be sent out soon!!! $25 or 1 more Mountain Level donor and we'll meet the goal! Thank you again generous donors!!! ALMOST THERE! $50 MORE! That's just TWO Mountain Level donors!!! Donate $5 and my class and I will be grateful to you. Donate $10 and you will receive Pebble Level reward and a thank you e-mail from me. Donate $15 and you will receive all previous rewards and a handwritten snail mail thank you letter will be sent to you! Donate $20 and receive all previous rewards. Your name will be posted in my classroom during the next academic year on my whiteboard donor wall. Donate $25 or more and receive all previous rewards as well as a copy of my favorite book in the mail! Children are definitely the future! I support you supporting them! Go Jace! Chang the world! As a fellow educator, this makes me extremely happy! Awesome Jace!